FreshGrade is a digital on-line portfolio that can showcase many of the experiences and learning your child will do during the upcoming school year. You will get access to a password-protected portfolio of your child’s progress, viewable across all major digital platforms. Only you can see your child’s progress. You may see regularly updated teacher feedback, work, photos, video, and audio recordings of what your child is doing in class. You can view and comment on these learning artifacts for yourself, your child, and their teacher to see. Engaged parents have a direct and positive impact on the successful development of a child. FreshGrade allows you to engage with your child’s learning through a digital portfolio. You and the teacher can easily communicate and collaborate on your child’s learning through the simple FreshGrade app and website. Each active student account in FreshGrade requires a signed parental consent form. You will then receive an e-mail from FreshGrade inviting you to join your child’s portfolio. If you didn’t receive an e-mail please check your junk/spam folder, especially if you have a Gmail account. If you still haven’t received an e-mail, please contact your child’s teacher for assistance. We recommend that you schedule a time and day in each week to sit down and look at any updates that are on your child’s portfolio. Your child’s portfolio is a living document, which means it will change often. It is designed to show your child’s progress over time. You will be able to watch and see how your child’s work evolves towards meeting the standards throughout the year. 1. How often should I log in to the portfolio? Log in to the portfolio as often as you like. Logging in at least once a week with your child is advisable to stay up to date and encourage conversations about their learning. 2. How should I talk to my child about what I see? Invite open-ended conversation such as: “Can you tell me about…” “What do you like about…” “What are you most proud of?” “What were you working on?” “How can I help you with your goals?” “What is your next goal and what steps can we take together to get you there?” Keep it positive to help your child feel open about sharing. It may take time for parents to feel comfortable commenting on and guiding their children’s learning in a digital space. Face to face conversations are always best and a great way to start. Please continue to communicate with your child’s teacher in a way that works best for your family. You might also look to the teacher’s comments as a model and jump in whenever you feel comfortable. 3. How often should I give written feedback to the teacher and to my child in the portfolio? This really depends on the other ways you communicate with your child and his or her teacher. Parents who are not able to be in the school very often my find it helpful to post a question or comment once a week to stay connected. Interact with the portfolio as much as you need to maintain meaningful insight into your child’s learning. Only your child and your child’s teacher see your comments. The portfolio is not intended to replace other modes of communication so please continue to call, have face-to-face conversations, or other modes of communication that work best for you and the teacher. 4. What types of comments are helpful to my child’s learning? Instead of saying, good job, consider “good job on…” “I like the way you are…” “I’m proud of you for…” Specific and decriptive comments help the child become more aware of what they are doing – which is a powerful part of learning. 5. How can I help my child at home? Try to stay connected and check the portfolio often so that your child’s learning needs are being met in a timely fashion throughout the year. *When viewing the portfolio click show to reveal descriptions about what the learning intentions are for a particular post and view any resources the teacher may have attached. 6. How is FreshGrade different from a traditional report card? FreshGrade is not a report card. It is a means of regularly communicating student learning through digital posts. 7. Who has access to my child’s account? You, your child and your child’s teachers have access. 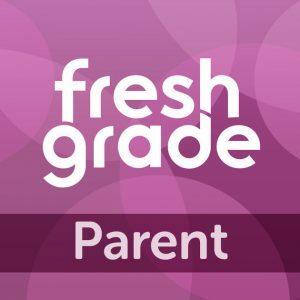 Tablet or Phone: Search FreshGrade for Parents on Apple App Store or Google Play. Make sure you get the parent app, similar to the photo below.